One of my favorite things about the weekend is starting the day in the kitchen. This past weekend was relaxing and productive. I baked this peach raspberry breakfast cake, organized my refrigerator (always a big task) and enjoyed spending time outside. Life’s good in the kitchen and it is even better when you have great people and appliances to help you. Have you seen the new show “The Kitchen” on the Food Network? Katie Lee stars in the show and in LG Electronics videos featuring the Door-in-Door refrigerator. I don’t watch a lot on television, but I do love watching other people experiment in the kitchen. After watching the show, I thought about what I would bake up next in the kitchen, and also started thinking about updating some of my appliances. LG Electronics is the official sponsor of The Kitchen and is providing all of the appliances for the set, including everything from the refrigerator and oven to the microwave and cooktop. I am very happy with all of the LG appliances that I have purchased and have my eye on the new Door-in-Door refrigerator. In fact, I took one look inside of my fridge this weekend and decided that I needed more space, more storage compartments and better organization. The LG fridge is exactly what I need. 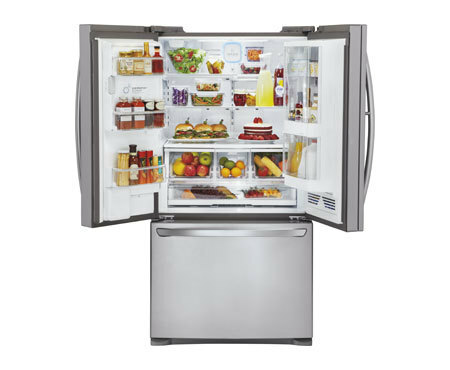 How would you love the chance to win the newest LG Door-in-Door Refrigerator? Head over to LG’s Facebook page to enter the “Caption This” contest for a chance to win your own new LG Door-in-Door Refrigerator. Peach Raspberry Breakfast Cake includes everything that I love about summer. It is fresh, flavorful and bursting with peaches and raspberries. Start the day in the kitchen, grab a slice of this breakfast cake and enjoy your day! In a small bowl, toss the peaches with ¼ cup flour; set aside. Whisk together the remaining flour, baking powder, cinnamon and salt in a medium bowl and set aside. In the bowl of an electric mixer fitted with the paddle attachment, cream the butter, lemon zest and ¾ cup plus one tablespoon of sugar together until light and fluffy. Add the egg and vanilla and beat until combined. Add flour mixture to the batter in 2 batches, alternating with the buttermilk. Gently fold in the peaches, then the raspberries. Some of the raspberries may break up but be careful not to over-mix. Spread batter into greased baking dish and sprinkle batter with remaining tablespoon of sugar. Bake for 35 to 45 minutes, or until top is slightly golden brown and a toothpick inserted into the center comes out clean. Allow to cool for 10 to 15 minutes before serving. Enjoy! Life's Good in the Kitchen! Start your day in the kitchen baking this Peach Raspberry Breakfast Cake that the entire family will love! Don’t forget to head over to LG’s Facebook page at http://lgkitchencaptions.com and write a witty caption to a scene from LG’s brand new home appliance commercials. Entry starts 06/20/14 and ends 07/31/14. Public voting starts 08/20/14 and ends 09/03/14.